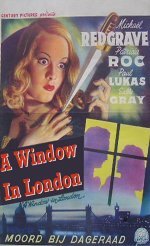 From the window of a train, Michael Redgrave sees what appears to be somebody strangling a woman in a house. He goes to the police, but the couple in question (Paul Lukas, Sally Gray) turn out to be an illusionist and his wife rehearsing their act. Some weeks later, Redgrave and his wife (Patricia Roc), again from a train, witness a repeat performance of the incident. Directed by Herbert Mason, it's a short, modest but intriguing British-made thriller which offers a good cast and supplies a satisfyingly neat twist.